This post was written as part of a collaborative effort with a group of fellow food bloggers to raise awareness for our public lands. One of the best ways to protect our public lands is to use them responsibly and share them with the people you love. The greater our connection with our public lands, the more invested we all are in ensuring their protection. So this summer, take somebody you care about camping and show them just how beautiful this country can be. For more information about our public lands and the effort to keep them open for all to enjoy, please check out Our Wild. This is how so many impromptu camping trips start; when you feel compelled to break away and just get outside. It’s most prevalent during the summer months but can happen any time of year. This feeling has hit us plenty of occasions. Sometimes we’re able to pull it off and enjoy a beautiful weekend outdoors. But other times we get tripped up by logistical hurdles and we are left wishing we were better prepared. The key is to do a bit of preparation BEFORE the feeling hits. If you get yourself properly set up at the start of camping season, you’ll have the ability to pick up and blow town whenever you want. 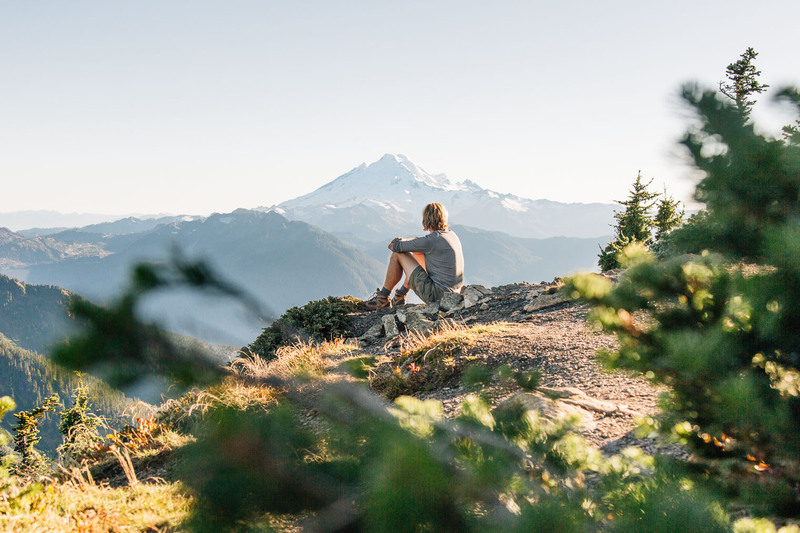 So to help set you up for success this summer, we developed this guide on how to pull off a last minute camping trip – some of our best tips to help you get out the door and into the woods, and 10 of our favorite last minute camping meals. There are plenty of other lesser utilized public lands where you can camp that lack the crowds of more popular destinations. National Forests, BLM land, National Grasslands, and National Rec Sites are all viable camping options, and with 640 acres of public land nationwide, chances are there’s a patch of dirt under a big open sky with your name on it available this weekend. These types of public lands typically lack the amenities of National Parks and more established campgrounds (like dumpsters, potable water, etc. ), which means you have an even greater responsibility to ensure you leave no trace. But for a short-notice weekend getaway, they are invaluable and available to everyone. Check out our comprehensive guide on how to find camping on public lands. One of the best deals out there, an interagency parks pass is your ticket to more than 2,000 federal recreation sites all across the country. Each pass covers entrance fees at national parks & monuments and national wildlife refuges as well as day use fees in national forests and grasslands, and at lands managed by the Bureau of Land Management, Bureau of Reclamation and U.S. Army Corps of Engineers. In some locations, carriers of an interagency pass are also entitled to reduced campsite fees. Every year we buy an America the Beautiful Interagency pass and every year we get more than our values worth out of it. If you plan to visit a few federal sites this summer, this pass is definitely worth it. One of the biggest challenges standing between us and getting out the door is corralling all our camping gear into the car. Too often we find that some of the gear is in the garage, some of it is in the shed, some of the cooking gear has been reintegrated back into the kitchen, and some stuff is still in the top box. Inevitably, if our gear is spread across the whole apartment, we end up forgetting some critical item. At the start of the season, consolidate all your camping gear into one location. Go through each piece of gear and see if it still works or needs to be replaced. We store a lot of our gear in custom made wooden crates and in Action Packers. They come in a few sizes (8 gallons and 24 gallons are our favorites) and are perfect for holding all of your camping equipment. If you want to be super organized, you can even put labels of what each box contains. A roof rack with a top box is another great way to store your camping gear. Early on we picked up a Thule top box from REI, which might be one of the best decisions we have ever made. 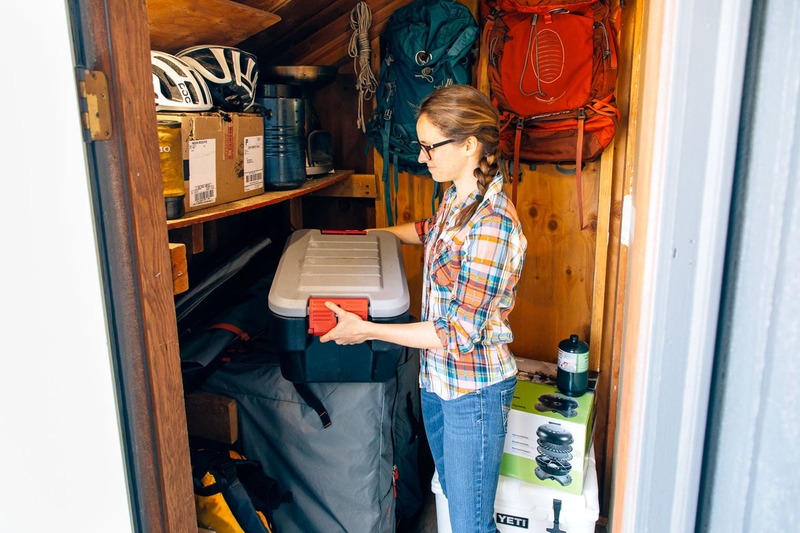 If you store your camping gear in the top box at the beginning of the season, then when you want to hit the road you’re pretty much already packed. Regardless of your storage solution, just try to keep all your gear consolidated in one place so it’s ready to go when you are. So rather than endure such a tragedy ever again, we suggest buying some cheap yet functional camp kitchen gear and keeping all together in one place. Check out our Camp Kitchen Gear recommendations here. If you camp often, building a dedicated camping pantry at the beginning of the summer can be immensely helpful. For the same reason as listed above, it’s just easier to have a separate set of dedicated olive oil, salt, pepper, spices, etc. in a ready-to-go box. You’re looking for shelf-stable ingredients that you can use to build meals out in the field. If you want to learn more about how to build a camping pantry, check out our article about it here. We recently bought a Yeti Tundra 35 cooler and – in our opinion – it was worth every penny. Being able to carry perishables for days is great, but having to stop for ice at a convenience store can slow the whole process down. So, we recommend buying reusable ice packs to keep in your home freezer. This way, all you need to do is pack your cooler, throw in your pre-frozen ice packs, and hit the road. Not only does this reduce a stop, but it means you won’t be left with any melted water at the end of your trip! 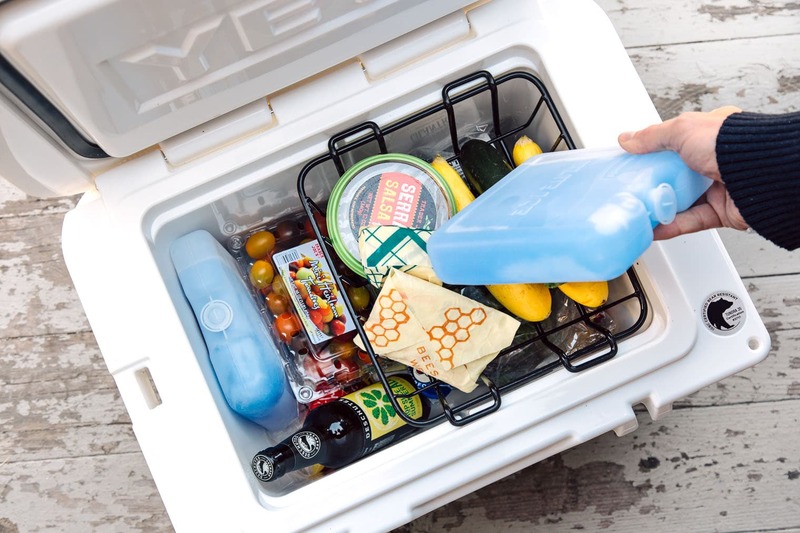 Learn how to pack a cooler like a pro here. If you’re planning on visiting some of the “lesser traveled” public lands mentioned above, be warned that most of them don’t have potable water. You could pick up bottled water from a gas station, but it’s much more economical and environmentally-friendly to buy a large water jug and fill it up at home. We’ve used both collapsible and rigid versions. If you have space, the hard sided ones will last a lifetime. But, if you’re tight on space, the collapsible ones will work just fine. 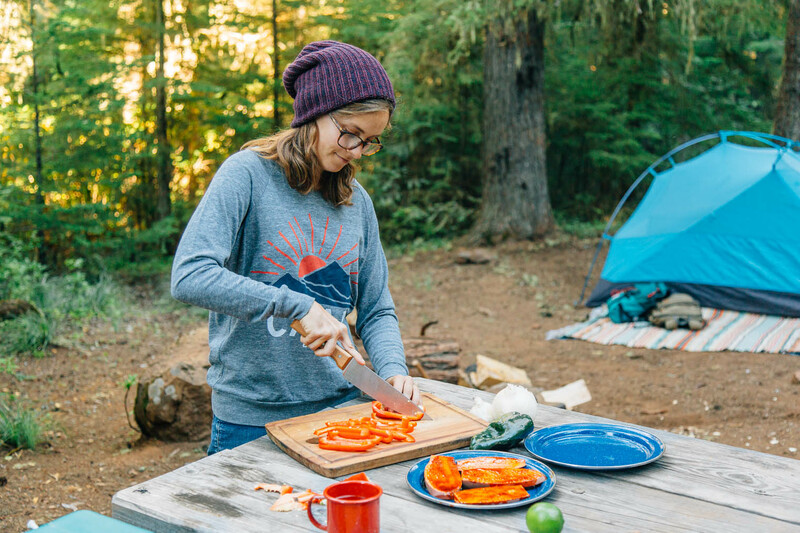 The biggest hurdle of a last minute camping trip, for us, is meal planning… or lack thereof. While we enjoy camp cooking (obviously), if we’re heading out to the woods on a whim, we usually turn to simple, tried-and-true camping recipes that don’t require a ton of pre-planning or any advanced prep. Here are some of our favorite camping meals – you probably have many of the ingredients already in your pantry, and rest can be picked up at the grocery on your way out of town. Pancakes: Whether you buy a premade batter mix or make your own, pancakes are a quintessential, low maintenance camping breakfast. Our favorite is this Blueberry Banana Pancake recipe. Skillet Hash: Saute some veggies and potatoes in a cast iron pan, crack in a few eggs, and breakfast is ready! Hash is another easy breakfast that can be endlessly adapted to whatever you have on hand. We’ve even made a version using a can of chickpeas instead of potatoes! Oatmeal: Perhaps the most versatile of all camping breakfasts, oatmeal can be as simple or elaborate as you wish. We love this apple-pie inspired oatmeal that requires just oats, apples, and a few spices you likely have in your kitchen pantry. 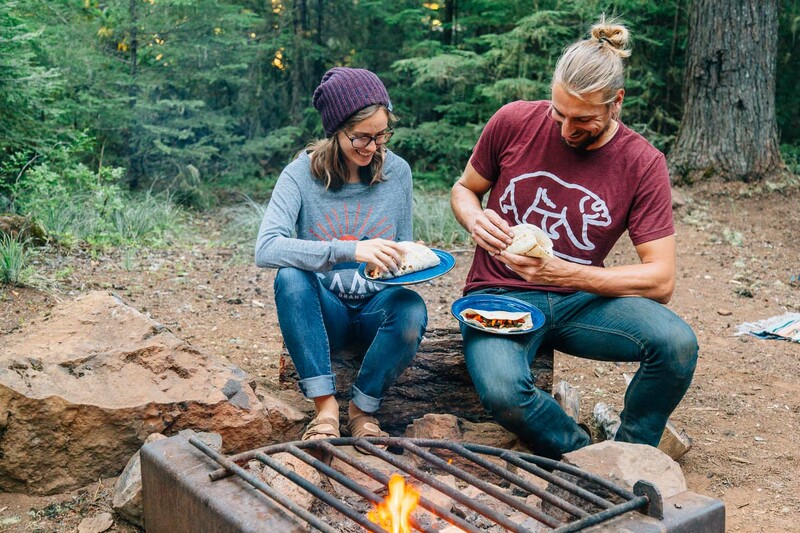 Tacos: Requiring only a few ingredients, tacos are perhaps our favorite camping meal. These Sweet Potato & Poblano Pepper Tacos are our favorites so far. Stews: What better way to take advantage of your time hanging around the fire than to cook up a great campfire stew? This Sweet Potato and Peanut Stew uses a bunch of pantry items and is super filling, yet doesn’t take hours to make. If you’re looking for something a little more camp stove friendly, this red lentil stew made with coconut milk and kale comes together in less than half an hour and is packed with protein. Paella: Paella might sound extravagant but all you need is rice, wine, broth, veggies, and some protein. Traditionally, the dish calls for saffron, but it’s totally cool to skip it for simplicity’s sake. We’ve made this dish with a dozen different vegetable + protein combinations, but this recipe is a good place to start. One Pot Pasta: This meal is as simple as 1) Water 2) Pasta 3) Sauce, but if you’re swinging by a grocery store on your way out of town you can get as creative as you’d like with additional ingredients or toppings. This version uses red lentil pasta, easily found at Trader Joe’s, for a super protein packed one pot meal. If you don’t have a Trader Joe’s nearby, this one pot orzo recipe can be made with whatever cheese and veggies you have on hand. Nachos: The sky’s the limit when it comes to dishing up nachos on your camping trip. Whether you simply scour the fridge as you load your cooler, or pick up your favorite toppings from the store, there’s really no wrong way to make these as long as you have your bases of chips, cheese, and salsa covered. We love this easy version that includes black beans for protein so we can call this “dinner” and not feel too guilty about it. Want more inspiration about how to get out and explore your public lands, along with some great recipe ideas? Check out some of our fellow food blogger friends! Thanks for these tips for a camping trip. I’m glad that you mentioned it’s important to try to make sure all your camping gear is in one location. This sounds useful if you need to take some gear out quickly as soon as you arrive. Loved this post. people who loves to travel ,will love your post ! @FOTG Thanks for this awesome content. So refreshing to actually find something that makes sense. Please could you share food storage ideas? Probably the hardest thing to come buy – Trying to pack something to make a decent meal with that isn’t just plain cardboard type stuff. You’re welcome! We carry a lot of our foodstuff in Action Packers. But we’ve been thinking about doing a whole article just on food storage options. Thanks for the suggestion. Amazing! All the tips are useful which can make my trip more comfort and enjoyable. I love camping and this article is helpful for me. Sounds fantastic! Best to both of you! Hi there! Are you guys still car dwelling?? Love your posts! To go for a camping trip is something like wow!! I love traveling and want to travel all over the world. I also like camping. I found that “10 Last minute meal ideas” are very useful in your article. Thanks for sharing! Great info and I’m pinning it to share with other campers. camp cooking is the best memory to share with friends,family. I definetely agree that having a dedicated pantry for camping is a great idea. It means when you are packing you can put everything in it and get ready to go. I used to forget stuff all the time before I got one as I was just placing the stuff in different packages. Thank you for showing us how, Megan! 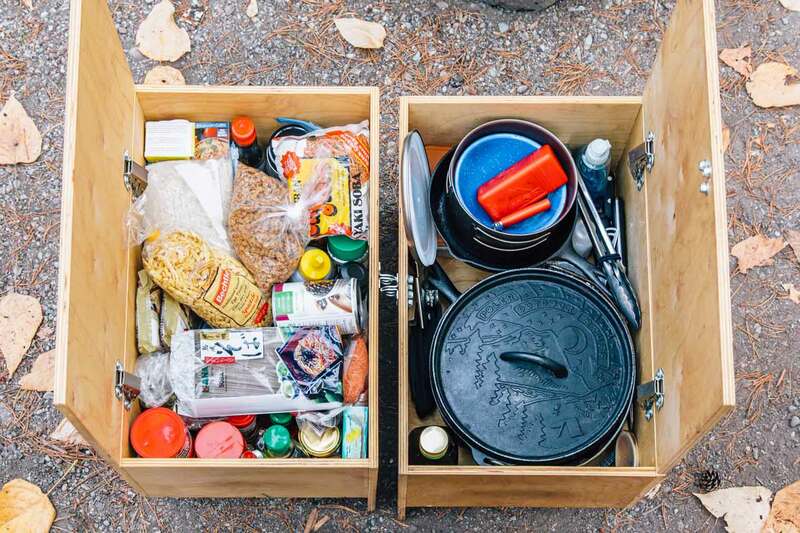 Love those stow boxes and all the resources for eating well at the camp site! Kitchen gear, could you maybe post a list of all the things you’ve found you have in your camping kitchen? Thanks! Love love love this post! We do all of these things and it makes getting out so much easier. We usually just keep our camping bins in the truck during the summer so we can fill the cooler and go with only a moment’s notice. I love your homemade wooden crates. So cool. We had a wooden cooler Anders made for a while but just upgraded to the Yeti. Can’t wait to see how it works. Anyways, thanks so much for joining the campaign today and I’m so glad I found your blog. I’ll be following along!